Okay so maybe it's just a rebodied Camaro, but so was the original Pontiac Firebird. It’s a funny thing how many of us will claim that the muscle car wars of the 1960s and 70s have been fully revived without considering one major problem with that statement. That’s the fact that many of the iconic machines of the real muscle car era are dead and gone, likely never to come back from the dead. Dodge has the Challenger and Charger, Chevy the Camaro, and Ford still slings the Mustang, but there are a few notable cars that are completely absent from the 2010s revival era. Think of the Plymouth Barracuda, Buick GSX, Mercury Cougar, and Pontiac Firebird outfitted with the Trans Am package. To purchase the latter of those in a 2017-approved package, a visit to the custom tuning shop is needed. With a six figure sum of cash, Trans Am Depot is willing to sell you a 2017 model Trans Am complete with Smokey and the Bandit livery. 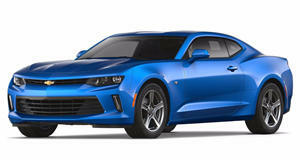 Like the original Firebird, it’s based on the Camaro except it carries over a new body that lends a modern interpretation of the original Pontiac to the roads and features a small horsepower bump that puts this muscle car's output north of Hellcat territory. To tease us with the premier of Jay Leno’s Garage, Leno and fluffy comedian Gabriel Iglesias take the 2017 Trans Am SE Bandit out for a spin. While the power and the looks sure are nice, make sure to pay attention to the details strewn around the car that recall Burt Reynold’s iconic movie.